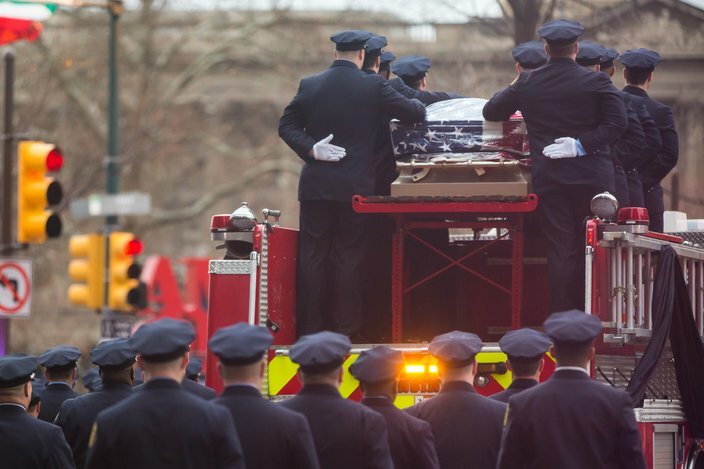 The casket for Philadelphia fire Lt. Matthew LeTourneau is carried to the Cathedral Basilica of Saints Peter and Paul on 18th Street and the Benjamin Franklin Parkway on Friday morning for a viewing and Mass of Christian Burial. 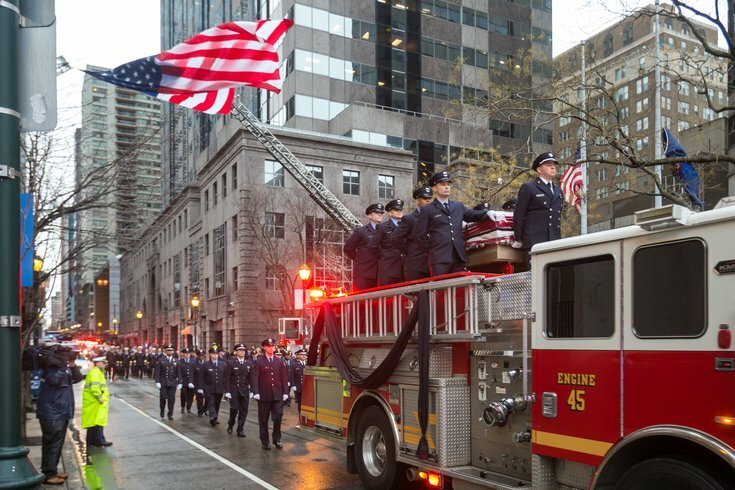 The city gathered Friday to bid farewell to Philadelphia firefighter Lt. Matthew LeTourneau, who died in the line of duty last Saturday. The 11-year-veteran was trapped by debris after the second floor of the North Philadelphia rowhome collapsed. After a viewing Thursday night at the Cathedral Basilica of Sts. Peter and Paul in Center City, another viewing followed Friday morning with a Mass of Christian Burial at 11 a.m.
Interment followed at Saints Peter and Paul Cemetery in Marple Township, Delaware County. Dozens of firefighters stand along North 18th Street at Cathedral Basilica of Saints Peter and Paul to await the arrival of the casket of Lt. Matthew LeTourneau on a rainy Friday morning. 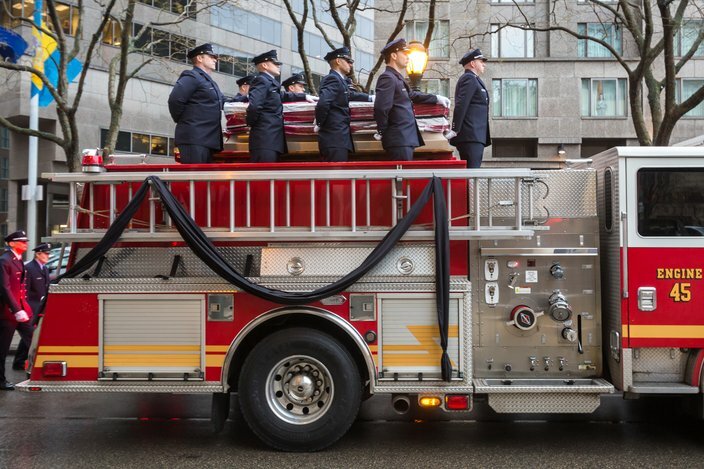 The casket of Lt. Matthew LeTourneau is carried through the rain on a fire truck on Friday morning. 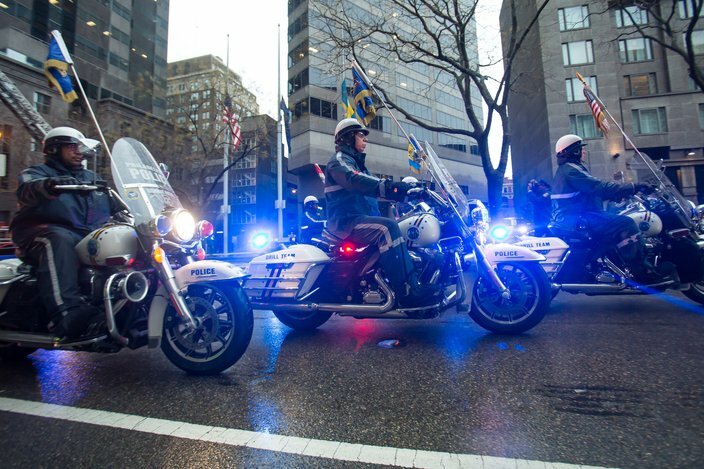 Members of the Philadelphia Police Motorcycle Drill Team ride in formation ahead of Engine 45, which carried the casket of Philadelphia fire Lt. Matthew LeTourneau to funeral services at the Cathedral Basilica of Saints Peter and Paul on Friday morning. 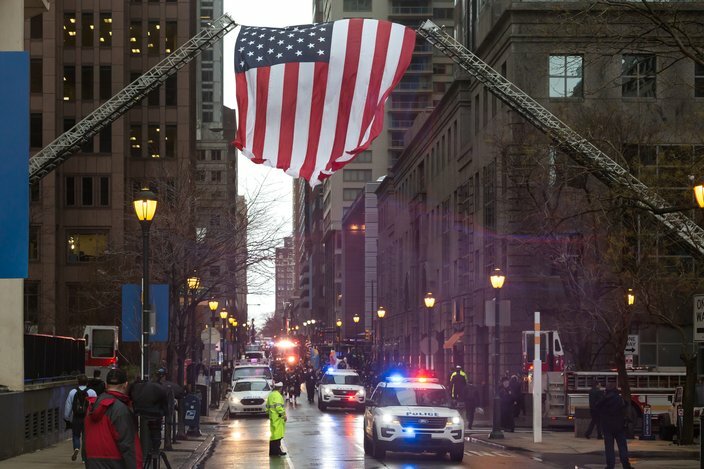 Police and fire vehicle line up for a procession Friday morning to the Cathedral Basilica of Saints Peter and Paul in Center City Philadelphia under a large American flag strung between two hook-and-ladders. 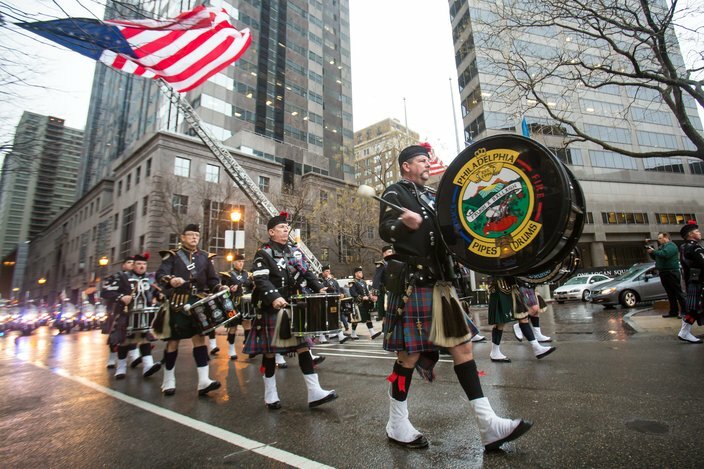 The Philadelphia Police & Fire Pipes & Drums corps marches to the cathedral on Friday. 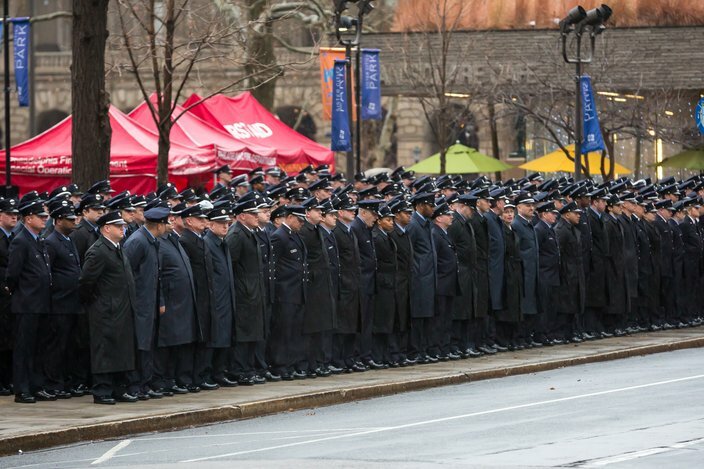 Philadelphia Fire officers stand over the casket of Lt. Matthew LeTourneau as the fire truck arrives at the cathedral for Friday morning's Mass of Christian Burial. 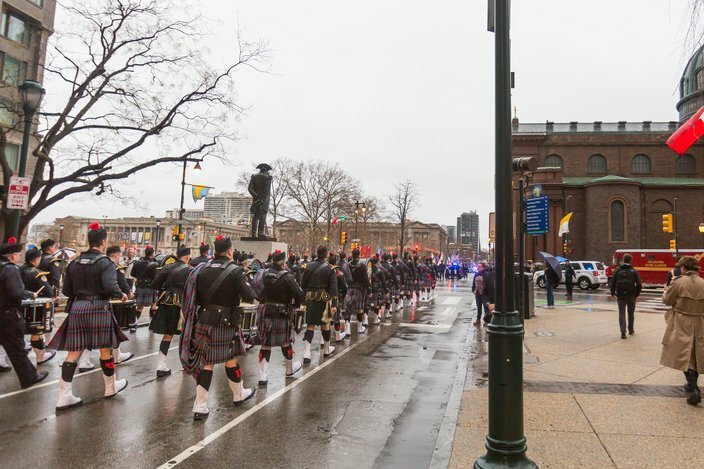 Band members of the Philadelphia Police & Fire Pipes & Drums process to the Cathedral Basilica of Saints Peter and Paul for the funeral service for Lt. Matthew LeTourneau of the Philadelphia Fire Department on Friday, January 12, 2018.